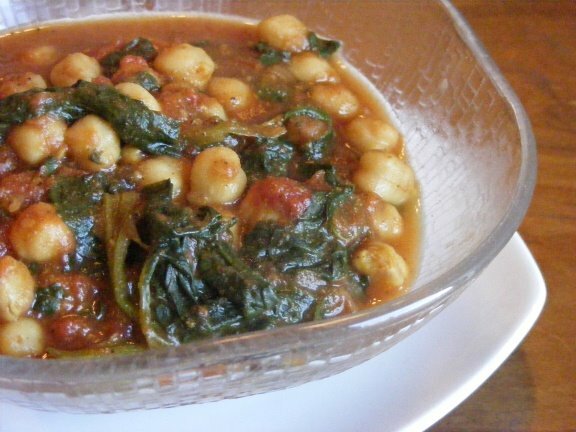 What’s with all the chickpea recipes lately? Honestly, I don’t know. I’m just drawn to garbanzos right now. They taste good (or rather, they taste good when you add yummy stuff to them) and they’re high in protein and fiber. And they’re easy to deal with, as in this recipe. Throw them in with some spinach, tomatoes and spices, let cook for 20 minutes and voila! Dinner (and maybe lunch the next day). In a large pot over medium heat, combine all ingredients and stir to combine; cover pot. Bring to a boil, then reduce to a simmer and cook for 20 minutes.